Do you want to grow your traffic? Do you feel like you can’t get any traction? 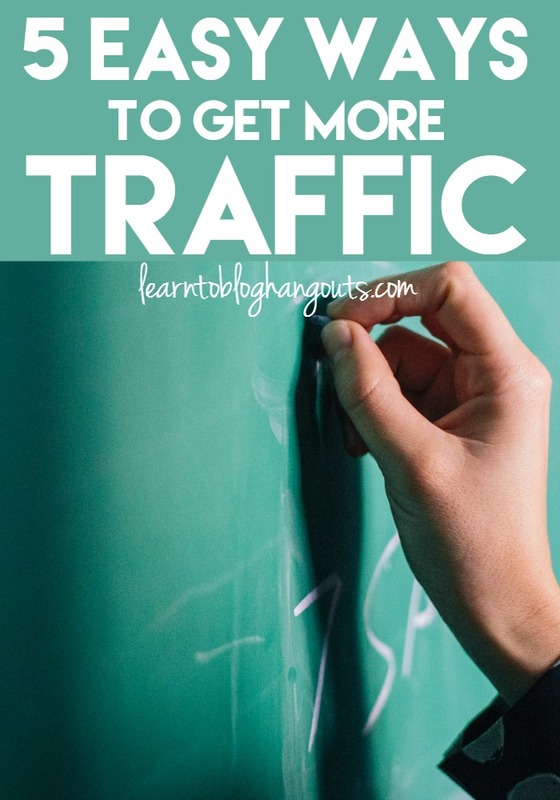 Learn five easy ways you can start getting more traffic today. Finding ways to get more traffic is one of a blogger’s main goals. After all, if we don’t have traffic, what do we have? A steady stream of visitors to your website is a large part of the foundation to a profitable blog. So what can you do? In this hangout, Crystal and Kelli go in depth on Five Easy Ways To Get More Traffic to your blog. Do you want to grow your traffic? 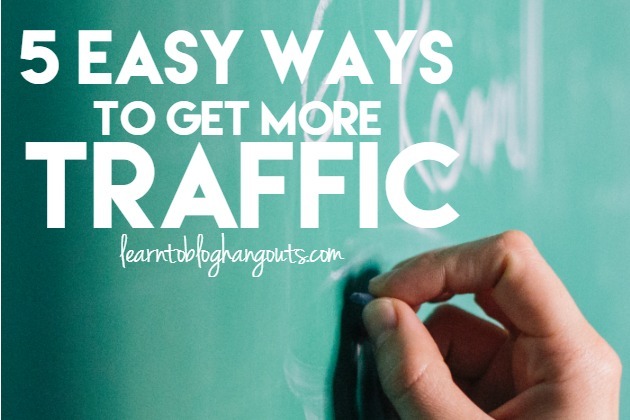 Learn five easy ways you can start getting more traffic today. From this point forward, make a commitment to use keywords properly, and even go back through old posts to update SEO keywording. Don’t forget to spend some time going over old posts and ensuring that they’re set up properly. Crystal points out that one of the best things you can do is to go back to your posts from the same season of the year previously (Fall, for instance), and update them to be search engine friendly. That way you can link to them in this Fall’s related posts, and build search engine authority. Not every post should be SEO-driven though, as Kelli says, doing so would make search engines think you’re trying to game the system! Your first priority is your readers, but you also need to do your best to be search engine friendly, so you can accrue more readers. Don’t just drop your links and run. Engage and communicate with people on your various social media platforms. Spend some time retweeting, repinning, and commenting on Pins, tweets, and Facebook posts. Stumble other people’s things on Stumbleupon. It’s a good idea to spend ten to fifteen minutes a day on each social media platform, but we all know how easy it is to get sucked into social media, but we can beat that problem by setting a timer, and scheduling things ahead of time. Think about what times are best for social media interaction. What times are moms sitting in the school line playing on their smart phones? Times like those are when your blog and social media interaction are going to spike. This is an especially go time to be active on Pinterest. Don’t just drop your link and run! Like and/or comment on fellow bloggers posts. It’s helpful for them, and will result in return likes and comments. Crystal has found that creating and using interest lists in Facebook makes it easy for her to quickly go through and like, comment, and share fellow bloggers posts. Using your personal profile to connect with other bloggers and their readers will impact the reach of a post much more than using your blog page profile. The lifespan of a tweet is roughly eighteen minutes, so tweet often – but not so often that annoy your followers. use the Easy Tweet button on blogs. You don’t even have to think about this one! The tweet is pre-composed for you – all you have to do is click to share! Buffer is a great web browser extension for scheduling out tweets (as well as other social media) in order to avoid clustering your posts and annoying readers. With the paid version, you can easily schedule social media while you browse, and with the free version, you can go into the app to bulk schedule. Learn how to engage and communicate on social media. Don’t just drop your links and run. Using the Thank Me Later plugin helps make your website more memorable, and results in more page views. How does it work? Simple! When a reader leaves a comment on your site, they are automatically emailed a thank you email which you have previously created containing links to, and info about your site. This is especially powerful when you set up a specific reply for each category on your blog. For instance, Crystal gets many comments on her Letter of The Week articles, asking for more of them, so for this particular type of post, the Thank Me Later automated email is set to send them links to more letter of the weeks articles. It’s very helpful for readers, and nets you more page views. Kelli and Crystal have a policy of commenting on at least five different blogs each day. Leaving honest, useful comments on other blogs will often result in not only the blog owner visiting your site, but many of the reader who see and enjoy your comment. If you host a link party, comment on linker’s posts! The blog owner will notice that you’ve taken the time to read their article, which creates goodwill, and keeps them coming back. Often, this also results in comments back, which boosts your authority with the search engines. Be interesting and engaging. 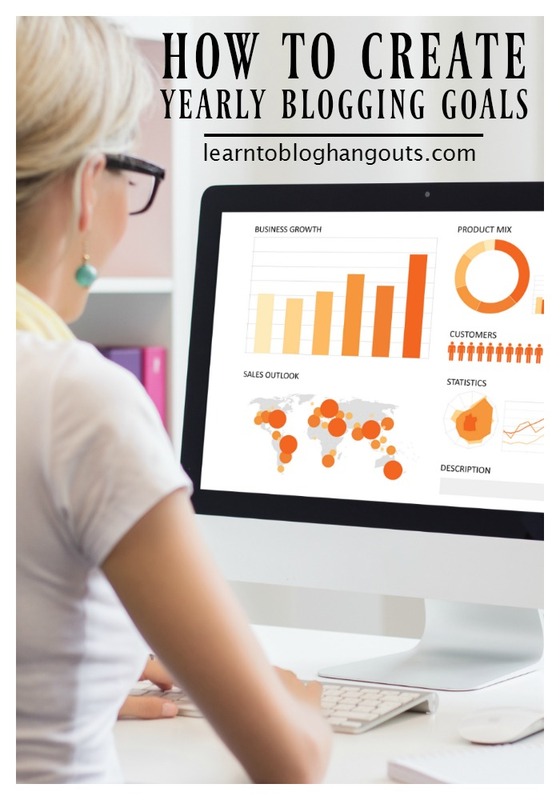 Build relationships with your fellow bloggers! So how do you find other blogs to comment on if you don’t host a link party? After all, we don’t want to constantly comment only on the same blogs! Use social media. Actually click through to those articles that show up in your feed! Use other blogger’s link parties. There will never be a shortage of posts on which to comment when you make a habit of scrolling through fellow blogger’s link parties! Utilize comments on your own site. Go to the comment section in your dashboard (it should be in the menu section on the left side of the screen in your WordPress blog). Often, commenters are fellow bloggers, and will leave their website address in the comment form, which makes it super easy to click through, read, and comment on their articles. If you’ve done something for someone who’s article you’re reading, it might be a good idea to let them know. For instance, if you’ve pinned their article to one of your board, leave a comment mentioning that you did so, and how much you think your readers will love it. This encourages them to check out your Pin board, and often leads to them following your board, which leads to them seeing your pins and eventually repinning your content and even clicking through, which can eventually generate quite a lot of traffic. Answer comments! Especially if it’s the first few in an article, answer the comments, and take it a step further by going over to the commenter’s site and commenting on their articles. Go to Amazon or other affiliates, and see what posts are making people buy things. Using information from those three sources, drive traffic to these posts via new posts. Round ups are great for this! Make the images pinnable if they’re not already, and pin them to every applicable board. Another way to get attention to older, popular or money-making posts is to advertise them in your sidebar. Create an attractive graphic that describes what the post is about (both with words and picture). For instance, for Crystal, her CrockPot Ravioli Recipe is one of the most popular articles on her site, so the for the sidebar advertisement, she has a picture of the dish, with its title, and an eye-grabbing graphic showing that the article has been pinned over 100,000 times. This grabs the reader’s attention. They know that this recipe must be worth reading given the pin count. First, you do have a brand. It’s you! Your blog is a faction of that brand, and you need to amplify it so that more readers can find it. There are so many ways you can do this! Amplify via social media. Cycle posts through Facebook, Twitter, Google+ and Pinterest. Guest post. By writing a quality, original piece of content on another site, you expose your brand to a whole new audience, gaining new readers for yourself, and, when you amplify that guest post on your blog and social media, new readers for the blog you guest posted on. Guest posting also helps build search engine authority when you write on topics that Google “knows” you for. Hi, I have been watching several of your google hangout videos a day and I love the great information you all are putting forth. I went ahead and signed up for your VIP Facebook page and paid the monthly subscription, but I am not able to see the step by step tutorials or any content for VIP for that matter. Is there something else I need to do? I hope this is still available.